Bang & Olufsen has created a new category for itself this week, with the arrival of the £900 BeoSound 8. The brilliant-looking, great-sounding iPod dock is the first from B&O who claim that it is "the best of its kind in the market". The BeoSound 8 certainly has the looks. 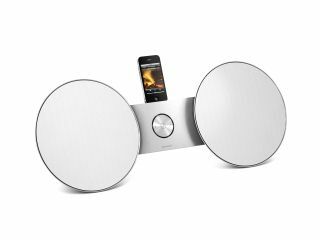 It packs two 70w active speakers (both come with two amps inside), which give the dock its barbell-like design, and the device has also been given an aluminium centrepiece that houses the touch controls. The dock can be customised, too, with a number of coloured speaker fascias available. The speaker cones come in either white or black. The BeoSound 8 has been created with Apple products in mind. The dock is catered for iPods and iPhones and there is even a small backrest which can be used when you plug an iPad into the dock. That's right, it will take the might of the iPad without looking ridiculous. If you fancy networking the system, then it is compatible with Apple Airport Express. There is a USB slot and Aux-in, so even if you are not praying at the Apple alter you can use the dock to play your portable music, plug it into a PC and so on. B&O told TechRadar that the dock is transportable, rather than portable. This is because it is packing so much speaker power it needs to be plugged to the mains. As it is a B&O device, you can also control the BeoSound 8 with other Bang & Olufsen kit. So if you have one of its phones, then you can change the volume with this. The system also comes with a nifty round remote. The BeoSound 8 has UK release date of 'end of November' and will be priced at £895. TechRadar was one of the first in the world to get its hands on the BeoSound 8, so expect our initial verdict shortly.